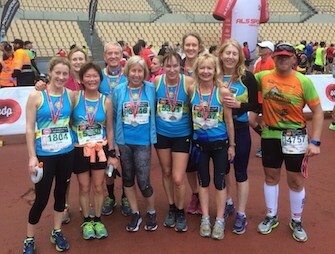 Twenty runners represented Mel’s Milers at the Seville half marathon, a record number so far for a trip abroad. Under the clear blue sky and winter sunshine over 6,500 runners (mostly Spanish men with a penchant for compression socks) set off near the Olympic Stadium on La Cartuja Island, on the outskirts of Seville. The route was mostly flat and weaved through the old quarter of the city along cobbled streets, passing many historical sites on the way, and ending back at the Olympic stadium with runners doing one lap of the running track to finish. All twenty Mel’s Milers finished the scenic course with Catherine Low posting the fastest time of 1 hour 45 mins, closely followed by Kathryn Hayhurst (1.46), who was the 2nd fastest V50 female overall in the race! Paula Reeves also managed a great time despite coming down with a cold the day before (1.49 mins). Congratulations to Colin Shaw and Sue Smith who ran together all the way and posted the most evenly paced split times of all of us. Also to Sharon, Fiona, Ann and Anna who always seem to run a good race and this was no exception (all managed under two hours). A special mention to Shirley Slough (her second ever half marathon), Sarah Inman (her first half marathon since Nice 2012), Lisa Love (who finished despite having an ankle injury) and Edwina Chandaman (for remembering how to run under 2 hours after selflessly supporting others in races over the last few years). A huge thank you to our four supporters who came to Seville and cheered us on at several points in the race. (Sarah Curran, Nicki Wolvern, Louise Philips and Mike Bransden) and also to Steve Wilson for his brilliant speed sessions which helped many of us kick up our heels for a sprint finish around the stadium track. With free beer, enthusiastic Spanish support (vamos!) and a free t-shirt that actually fitted, everyone came away feeling weary but happy. A thoroughly enjoyable day! Seville made a great place to stay. Flamenco dancing, a trip to Alcazar castle and the gothic cathedral, amazing tapas and great bars all added to this wonderful weekend.